Recently I am very much enamoured with sky high heels. I think it must be my petite height. 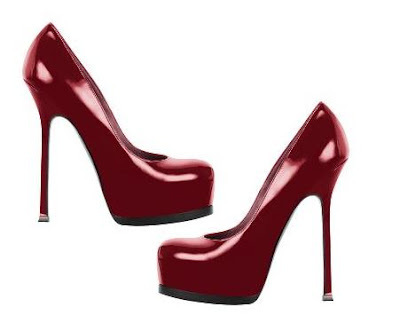 Anyhoo, the color red has been on my radar for a while and I have not been able to find the perfect pair of red heels. The other day I saw these at YSL boutique and feel in adoration with this pair of lovely immediately. Looking at the platform, a gal would think this pair of heels would be heavy as heck. WRONG!!! To my amazement and delight, these lovelies were very light when I picked one up to examine. So I asked the SA to give me my size, but it was not meant to be. I have fat feet. The toe box in the front was too narrow for my fat wide feet. *Sad!!! * I am still drooling over the color and the style. Even though my toes were in pain, my legs looked a mile long and I looked skinny and tall. For those gals with skinny feet, this pair can be yours for $795. Ouch! Maybe it is a blessing I have fat feet uh! I adore sky high heels, what about you? These are fantastic! I wore flats twice this week and it felt strange - I'm normally in heels! At my weight,I can't do heels (and I'm already 5'10"), but those are totally gorgeous!! everybody and their mama have those shoes, but that is because they are so amazing. designers shoes have skyrocketed nowadays, i remember yrs ago they are 400-500, now many are @ 900-1000 range. My feet hurt just looking at them. And at 5'9", I would be a giant. I dont know if I would be able to resist trying them on too! I didn't know there was such a thing as "fat" feet... sounds like YSL might need a better fit model for their shoe line. totally with you!! I can RARELY fit my fat foot into designer shoes ...sometimes if i size up, I can fit it ...but then it has to have a strap or be a boot to stay on. I really wonder who they make those shoes for? Gorgeous! I love these heels! and the funny thing i only wear round toe heels because... i have fat little feet! ha! maybe all petite women have fat littl feet ;P well thats what id like to think anyway! i am so glad i am not the only lone with "fat feet". : ) heeheee.... However, I am so with h on the price of shoes. What happened to 400 to 500 shoes. Wage didn't go up that much but shoes sure did. I love that YSL heels but I too, have "fat feet" and a "thin pocket" for that price. Hahaha! Please find something more affordable. I hope you can suggest a substitute with the same platform style and sky-rocketing heels. A classic! Love them.... so savvy, darling! Hi there-I adore the looking of them, but I know for a fact I could sadly not wear them! i love the YSL tributes! Have been wanting a pair for awhile now. After I convinced myself I no longer wanted them you had and go and post these gorgeous red ones! I am so in love with those tributes...they are the perfect color! LOL, I have wide feet too! Those YSL shoes are fantastic!! I am picturing a woman with a broken heel walking to a meeting in those.... The heel looks like it would break. Gaw-juss. YSL never fits me but I'm always drooling over it. Yes! Me too! I love sky high heels. I'm petite too and anything that boosts me up a bit higher is always a great plan. And YSL seems to love their high heels. One day I'd love to have a pair! what a fantastic pair of shoes. but i think, i can't walk with shoes the cause of its to much high heels. There are different types of boots and casual boots, athletic boots, the shoes of the line, wedding boots boots for women, men’s boots and work boots.